Where do the Hutschenreuther porcelain come from? The company Hutschenreuther was founded in 1814 and since then they have not stopped developing porcelain figurines and other decorative items. His country of origin is Germany. In its porcelain figurines you can perfectly appreciate the quality and reliability in each work. The porcelain finish on most of his figurines is glazed. What is the specialty of the company Hutschenreuther? This prestigious German company has become famous for the cups, plates, dinner services, decorative articles and table linen. The elegance of the tableware is exquisite, drawing collectibles, very useful for daily life and sometimes a little more delicate, for special occasions. The motifs of its porcelains are usually flowers, butterflies, animals, etc; and other decorative elements related to nature. In addition to tableware and cups, Huschenreuther has made many porcelain figurines and vases of extraordinary beauty and elegance. 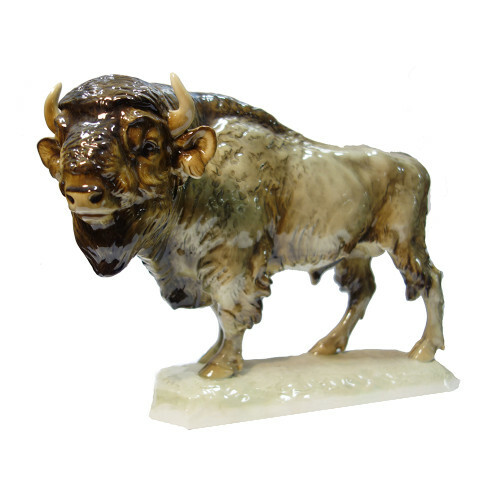 The porcelain figurine exposed in this article, is a bison in standing position. It can perfectly be observed the realism in the expression of the bison and naturalness in the colors. The size of the porcelain is 20 x 41 x 32 cm and its price is not too expensive for the size of the figure, € 600.00. Which is the value of the porcelain figurines Huschenreuther? Actually, the economic situation has made everybody to lose a little bit, the desire to buy or invest in these kind of items. As it is known, in times of crisis, the sectors of the economy that notice much more the effect, are those who engage in the sale of kitchenware, decoration and advertising. For this reason, the current valuations are not quite 100% objective,due to a shortage of money and the resounding drop in consumption, which causes excessive low offers to sell things. The value of the porcelain from the first period of Hutschenreuther are very high, due to their age, their scarcity (formerly not too many figurines were elaborated because the scarcity of resources) and above all the prestige that comes from knowing that many of these figurines and others Huschenreuther porcelain items are exhibited in museums with international prestige. The bison of porcelain of the photo is a piece that can be, perfectly, used to give contrast and originality to your decor. The colors and distinction that offers such impressive animal, gives character and distinction to the decor. Keep in mind that the decorative elements whose motives are animals, are, actually, very popular.